Rumor has it that DICE was once a Cobra NIGHT-CREEPER; but was kicked out for being TOO evil! 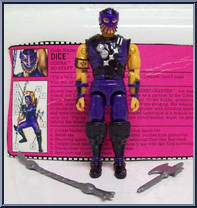 Dice operates as a partner to the Cobra Ninja Swordsman SLICE, specializing in choke holds, pressure point. . .
DOJO was the secret pupil of a Ninja master in hiding and was taught how to utilize the secret combat techniques using chain and sickle, three section staff, sai, and throwing dirk. Impressed with Doj. . .
Nunchuk studied mystic fighting forms at the school of a mysterious blind master in Denver. Driven by the need to perfect his form, Nunchuk moved to San Francisco and enrolled in a martial arts school. . . 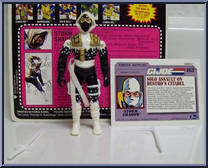 Captured Cobra documents indicate that SLICE may be a renegade Ninja from STORM SHADOW'S very own clan! It is believed that Slice created his own evil sword technique by observing the battle strategie. . .
STORM SHADOW is a former U.S. Army LRRP, former Cobra Viper, last Grand Master of the Arashikage Ninja Clan, sword brother to the inscrutable SNAKE-EYES, and now the leader of the newly formed G. I. J. . .
A former disciple of the master swordsman of STORM SHADOW'S Ninja clan, T'JBANG forged and honed his own personal sword, precisely balanced for his ultra-secret technique, known only as the "Sile. . .